I have always had a good amount of gelatin in my diet. I like it in your typical Jello form but also in my favorite candies, other desserts and even soups. It wasn't till I looked at my diet closer that I found exactly how much gelatin I usually consume, and how often. I had seen a mention on an Instagram photo about the benefits of eating gelatin. The photo claimed it was a diet food and was good for hair, skin, nails and joints. I decided to research it. I found so many amazing benefits that I decided to give myself a challenge. I decided that I would eat gelatin in some form every single day for 3 months and then assess my results. I was pretty impressed after 3 months, but my 5th month just finished and I am absolutely in love with the results! Gelatin or gelatine (from Latin: gelatus meaning "stiff", "frozen") is a translucent, colorless, brittle (when dry), flavorless foodstuff, derived from collagen obtained from various animal by-products. It is commonly used as a gelling agent in food, pharmaceuticals, photography, and cosmetic manufacturing. Gelatin is used for weight loss and for treating osteoarthritis, rheumatoid arthritis, and brittle bones (osteoporosis). Some people also use it for strengthening bones, joints, and fingernails. Gelatin is also used for improving hair quality and to shorten recovery after exercise and sports-related injury. Digestion: Gelatin absorbs water so it keeps things moving through the gut and helps with digestion and constipation. Reduces inflammation and helps repair the intestinal lining. Gelatin can also help with leaky gut. Healthy joints: You read that part about gelatin being derived from collagen, right? We know joints need collagen to be healthy and this is a great source of it! Athletes have used gelatin for joint pain relief and as an anti-inflammatory. Skin & Hair: Speaking of collagen....those anti aging creams they sell aren't as effective as a daily serving of gelatin, and it's cheaper. Gelatin also contains keratin which is essential for healthy nails, hair, teeth and skin. Sleep: Gelatin contains glycine and consuming it before bed helps induce sleep. Nutrition: Gelatin contains 6 grams of protein per tablespoon. 1/2 of your essential amino acids. Glycine, which helps your liver release toxins. * My nails are longer and stronger. Finally! * My joints quit hurting all the time and when they do bother me, it seems to be a much shorter episode. * My hair is growing in much healthier, even with dying it last week. * My skin looks a bit less dry and aged & I've been sleeping much better. * My digestion issues have cleared up a lot and it continues to improve. * I lost a few pounds. I didn't really expect it and wasn't trying, but there it went! I'm very happy with these results! How did I do it? I bought plain gelatin and mixed my own "jello style" every 2 days. I have an extreme sweet tooth so this worked great for me. Especially for those after dinner cravings! 1 large 'table' spoon full of unflavored gelatin. I added 1 1/2 - 2 cups boiling water and stirred gently till absorbed. Then I add 1 packet sugar free jello style dessert mix. Mix thoroughly then chill and cut into squares. I ate 1/4 of this mixture each day consuming most of it after dinner. That's 1/2 cup a day, less if you only used 1.5 cups of water. Yes, I used commercial flavored, chemical crap. Yes...it was good! 😂 I did find that Walmart brand 'Jello' is the cheapest and it tastes the same. I experimented with adding my own juices and flavorings but have yet to settle on a fail-proof recipe, so I'll work on that! I did find a strawberry jello cup recipe from Attainable Sustainable that is A-Mazing though...so check that out in the meantime. I also made homemade marshmallows a few times. They were so good and even the kids loved them. I'll post that recipe soon. Also, a few days a month I made a bone broth which is rich in gelatin. Bone broth is awesome because you can eat it alone or use it to flavor rices, vegetable dishes or as a soup/stew base. It's easy to set & forget in the crock pot, so very little work. It can also be canned so a big batch can last a long time! Here is an excellent post on using a turkey to make Bone Broth by Back To Our Roots. Speaking of which you could buy Knox at your local store, but it's more expensive than a bulk version. Great Lakes also has this one with the green label and it is cold water soluble! That one is great for smoothies and adding to other drinks and recipes. It doesn't thicken the same so it's practically unnoticeable once mixed in, which makes it very easy to drink gelatin every day. 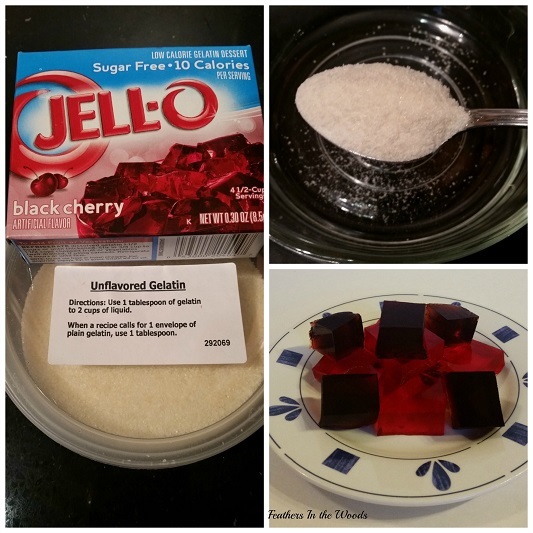 I have a lot more experimenting that I want to do with recipes and different ways to add gelatin to my diet. These last few months have convinced me that adding gelatin to my diet daily has made a huge improvement and now I'm just searching for ways to simplify it for the long run! 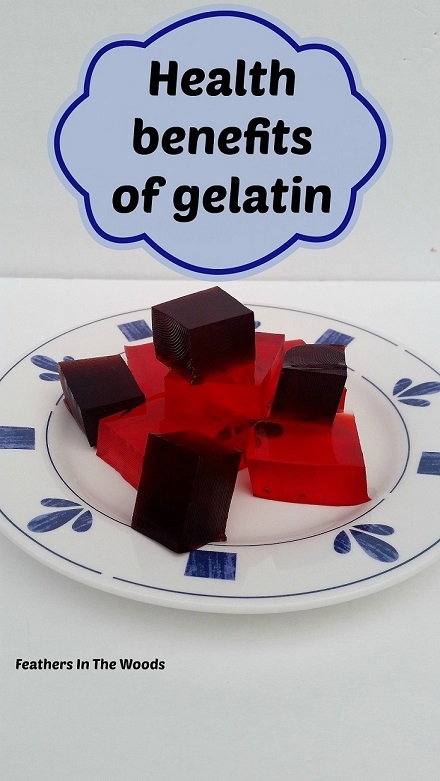 Since writing this post I have found so many great resources for information on why and how to add gelatin to your daily diet! Check out what Dr Axe has written recently and Martha Stewart's recipe for homemade marshmallows. Many other common foods have health benefits too! Check out these articles: The many health benefits of ginger, there are 13 reasons why parsley might be the healthiest thing in your kitchen and did you know that there are 12 Reasons why you should brew up some catnip tea? Try it! I am not a doctor or other health care professional nor do I claim to be. I am not trained in any medical field. I am simply passing on information that has worked for me. This information is for entertainment purposes only and is not meant to treat or diagnose any medical condition. see a Dr if you are ill. Click for my full disclaimer. 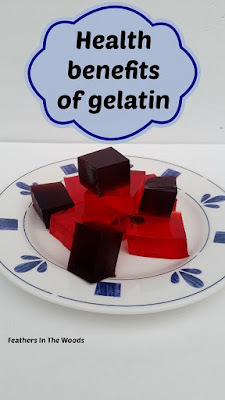 Adding gelatin to my diet is something I've been meaning to do for quite some time now! You are giving me the kick in the rear I need to get moving on this! I did the same thing...kept saying 'I should start eating more of this' and time just passed. Once I started though, it was super easy and seeing results keeps me right on track! I'm glad you stopped by! I'm heading over to check out your blog! If you're using the Great Lakes Gelatin to mix into your food or drinks, then yea....a tablespoon a day is enough. Very interesting. Thanks for sharing. About 10 years ago I lost 55 pounds on my own and I ate a lot of jello to help keep my from snacking on other junk. I wonder now if this is why I lost so well. Need to go make some now!! Such a great post! I've never thought that gelatin is so beneficial! It must be some kind of a "superfood" ;) Now I definitely plan to include meals with gelatin into my weekly diet plan. Hope it will work out! Give it a try....I think you'll be pleased! It shocked me when I first found out about it too. I mean, I knew gelatin was yummy but never dreamed that it was healthy! I never knew that gelatin had this many healthy benefits! This was a very interesting read, thank you so much for sharing your experience with this! Ya know, it's really crazy how many of our everyday foods are good for our health! I just love finding a foods purpose in our diet! I had no idea gelatin is good for your body! I would think it’s bad because I heard it’s from pork fat or something, however, now that I’m on keto I haven’t been as scared of eating fat as much as I used to before and it make sense! I was surprised too! Gelatin is actually made from the skin, cartilage and bones and has no fat content at all. Be careful on keto though as many gelatin recipes are high in carbs. I love collagen in all it's various forms, including gelatin! I myself have been incorporating more collagen in my diet, but usually though collagen supplements. I may have to give more gelatin a try! Definitely give gelatin a try. It's much cheaper than collagen supplements and can be used is so many different recipes. This is a really interesting article. I never knew gelatin has so many awesome health benefits. I do ADORE bone broth, and I feel better when I drink it. Congrats on the awesome results. I'm going to have to add more gelatin to my diet for sure. Cheers! Thanks! You should definitely give gelatin a try. I think you'll love the results. That is awesome that you can see the difference in your eyelashes and skin from just gelatin! Weight loss is a tricky thing, what works for some doesn't always work for others unfortunately. I also have been using gelatin supplements for a while too. In addition to the mentioned benefits it is also great for connective tissue repair and cartilage repair. I used the Now foods one that also has MSM and glucosamine in it. One heaping scoop a day is 8,000 mg hydrolyzed beef gelatin. You can get those pill makers and make them for on the go use. I do sometimes on vacation and take 2-4 in the AM and PM. I'll have to see if I can find that gelatin supplement....Glucosamine is great for joints also. Making your own gelatin filled capsules is a great idea! Yes, that would work just as well as the dessert style gelatin! I am adding 1 teaspoon on my coffee, I am hoping it helps me with my knee pain, and maybe with some fine lines too lol, lets see. Good luck with it! I think you'll be happy with the results. Hi there... How much should I consume per day? I ate about 1/2 cup of double strength gelatin a day when I made it like the Jello cubed. If you get the mix in type, then 1-2 spoons a day should be enough. Exactly! Which make gelatin one of those "superfoods" that are so popular now.